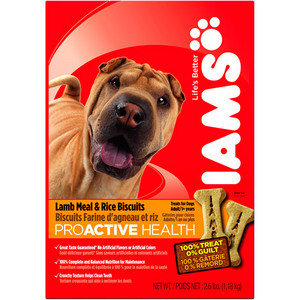 Iams has always been a trusted brand for us which is why we decided to try these biscuits. Each night my dog likes to end the day by getting a treat before bed. Sure she likes her biscuits but these shes seemed to enjoy more than others. Although I can not say how they taste, she seemed to have no complaints and the lamb and rice was different from the "typical/usual" biscuit . These were a good size for a medium size dog as each biscuit is approximately 2 inches long.. They seemed to have a good crunch which helps keep her teeth clean. My only disappointment is that the are very hard to find. I used to be able to buy them locally however, they became harder and harder to find. I was able to find online but the more reputable places are not carrying them anymore. Iams Lamb and Rice Bone Treats are hard crunchy bone shaped treats that dogs love. They are a good size for larger dogs but smaller dogs can eat them as well. They have a nice smell that dogs love when you take them out of the box and they have a better quality of ingredients than many of the other dog bones have. The crunchiness of the bones keep their teeth clean and tartar away. The dogs seem to love the flavor of the bones. They are a nice size for medium and large dogs but smaller dogs can have them as well. The dogs I give them to are large dogs and they gobble them right down. They do not give them any stomach upset either and they digest well. If you are looking for a dog treat that your dog will love, try these. They offer flavor, quality ingredients and clean our dogs teeth at the same time which is an added plus. Your dog will love you and will love them too. You can rest assured your dog is getting a healthy, quality snack at an affordable price. 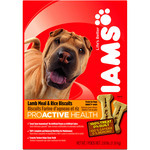 I like the Iams brand and when I saw that they had dog biscuits I decided to give them a try. Unfortunately, they are much too big for my dog. My dog is a Chihuahua so he has a tiny little mouth and can't chew large biscuits, especially if they are hard as these are. These biscuits are really sized for medium to large dogs and are not suitable for small to very small dogs. I did try these on my dog and he does enjoy the flavor it just takes him a very, very long time to get through one biscuit. He seems to enjoy the challenge though, holding it with his little feet as he chews away. The nutrition is very good and the Lamb Meal and Rice formula is good for dogs who have corn and/or soy sensitivities. There are quite a few biscuits in a box and while the price is a bit higher than other brands the quality is worth the extra expense and it it really doesn't come out to be that much more per biscuit than other brands if they are on sale. Overall, if you have a larger dog then these are a great choice, but those will small dogs should give these a pass as they are simply too big. Great for dogs with sensitive stomachs! Our little dog seemed to spit up a lot and we were told to get her off the dog food that we were buying as the main ingredient in it was corn and corn is difficult for dogs to digest. We put her on Iams lamb and rice and she improved quickly. When we read the label on her "doggie treats" we were shocked at the low nutritional value and what was the main ingredient? Corn. We switched her to the Iams Lamb and Rice" milk bones and now she did even better. The only size of the treats that we could fine was the larger ones so we broke them into three pieces and this works great. She gets her treats, they go a lot further and we no longer have a puppy with a stomach issue and we feel good that we are providing out pet with a product that not only does she like but one that is actually good for her. We recommend reading labels for pets as you would for yourself and giving your pet a healthy treat. Do you feed your dog treats? I do, but I am careful about which treats I feed and how much. The occasional treat never hurt any dog, but it is still nice to find a treat with decent ingredients and other redeeming qualities. This desire to find a better treat led me to Iams Lamb and Rice Bone Treats. Dog Food Facts and Commentary: Iams Lamb and Rice Bone Treats are small, bone- shaped dog treats that are crunchy and have little aroma, similar to a cracker. 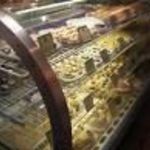 The treats take some effort to break and they contain ingredients that, while not as good as some of the better dog treats, are still better than those of most other dog treats on the store shelves. Iams Lamb and Rice Bone Treats are a nice size for most dogs. Larger breeds will crunch them up in reasonable time, but smaller dogs may have some issues, since the size is really intended for medium size breeds and up. This is why it is a good idea to break the bones in two if you have a smaller dog. One other nice quality with these dog biscuits is the teeth- cleaning abilities. They are crunchy and as a dog chews, the bones scrape against the teeth, helping to keep tartar under control. They are no substitute, of course, for a visit to the doggie dentist, but they are easily better than other dog treats, many of which are sticky/gooey and lead to the formation of tartar. Bottom Line Viewpoint: Dogs love treats and they deserve an occasional treat, but most dog snacks are not very high in quality. Iams Lamb and Rice Bone Treats are one of the exceptions, with better ingredients and other positive aspects. Again, they cost more than other, similar dog treats including Milk Bone, but they are still a good treat to serve your dog. Quality of Ingredients These treats contain better ingredients than what is normally found in a dog treat. Flavor Selection There are only a few flavors of Iams bone dog treats and most are very similar. Nope, don't want any other cookies! I began using Iams Lamb and Rice bones because my vet suggested that one of my dogs was having a reaction to corn (in most treats). All of my dogs love these treats and will do tricks for them. I now have a dog who will not consider any other treat. I have noticed that their teeth are cleaner as well. Great food for the weak stomach. I'm the President of a non-profit dog rescue in California and Iams is the only product my little Pomeranians can digest easily. If it's good enough for my dogs, then my rescue dogs are going to eat it too. Not only does my Pomeranian love his Iams but it helps to keep his health in good shape, activity level safe, and coat full and fluffy. I'd recommend this product to anyone with a picky eater. IAMS lamb and rice meal calms my dogs stomach. My large breed dog continually had stomach issues. He would get upset stomachs and vomit in my house. When we brought the issue to my vet, she recommended the IAMS lamb meal and rice variety. She said that the rice was gentler on the stomach than other grains. Since we switched to the IAMS lamb and rice, we have not had any digestional issues. It is reasonablly priced, comes in large quantities, and frequently I can find coupons for it.